Note: This is the second in a series of 2 postings on “Postmeaning.” Here’s a link to the first entry. …stmeaning” also via Twitter, starting on June 11, 2011, providing a snippet of the 100 word text and a link to the note or audio file in the Facebook page. An interesting detail about the Twitter via Facebook publication is that it cuts the 100-word posting down to a aize Twitter could manage, including making room for the shortened link and ellipsis. This creates a secondary cut, one that isn’t designed by Knoebel, which potentially creates a new textual iteration which could be interpreted differently from the original. Perhaps this accounts for the shift to shorter entries on July 21, which creates a direct concordance between the Facebook and Twitter texts, while at the same time allowing them to develop different audiences by eliminating the link to the Facebook Page. Recent correspondence with David Knoebel has been very fruitful in uncovering insightful information about his writing process. I type about a hundred words. Then I break out the result line-by-line. I often edit a bit at this stage, mostly to get rid of articles or unwanted adjectives. Then I select lines for the Facebook entry by bolding the ones I want, and cut that down, with more editing, to 140 characters so it also works as my Twitter feed, #postmeaning. 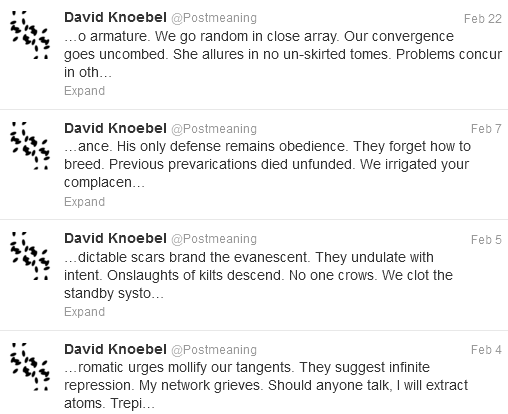 It is worth noting that each entry is written, not generated, which emphasizes the deliberateness of his strategies in “Postmeaning.” Knoebel was kind enough to share a PDF that shows his compositional process leading up to the Twitter-sized entry. For those interested, this is available to interested readers in the ELMCIP Knowledge Base entry for the project as an attachment.